OTAY MESA, San Diego, CA. 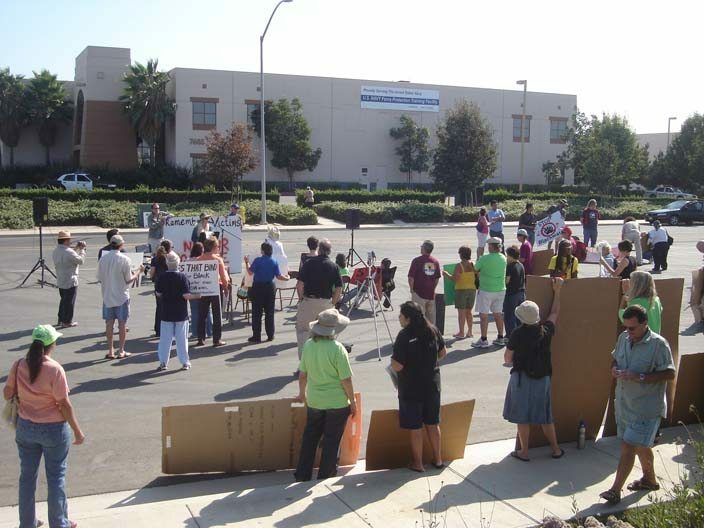 One hundred San Diegans protested on a warm Saturday afternoon, in the middle of an industrial park. 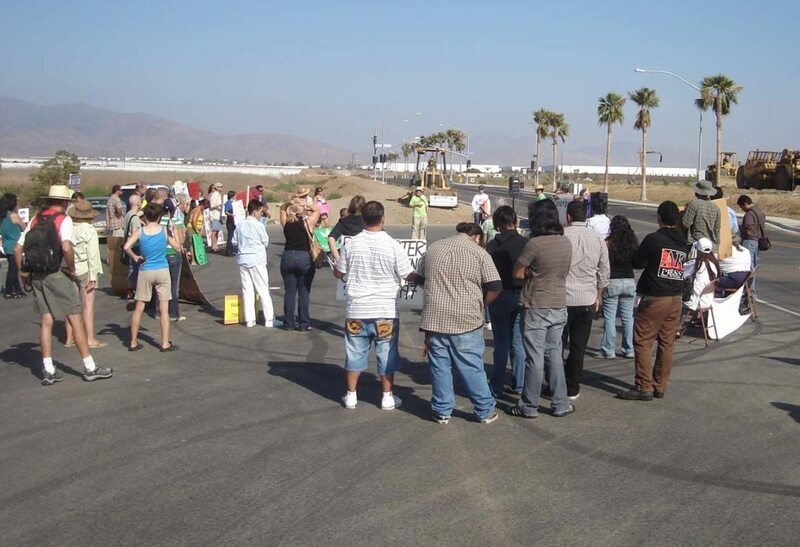 They were protesting the training facility of Blackwater, the mercenary outfit that is operating just a couple blocks from the U.S.- Mexican border. Within sight of the Mexican airport, in a desolate area where brand new massive two-story boxes dominate the landscape, the demonstrators were making their voices heard. They were there in opposition to the company’s presence in San Diego County. And there it was – Blackwater’s bland building – located at 7685 Siempre Viva, several blocks from the 905. And a stone’s throw from Mexico. The protesters were also commemorating the anniversary of a massacre of civilians in Iraq at the hands of Blackwater agents. On September 16. 2007, in Nisour Square, 17 people were gunned down by Blackwater guards without any provocation. No one has been prosecuted or held to answer for the massacre. The only media covering the event was a Mexican television station from Tijuana and the OB Rag. 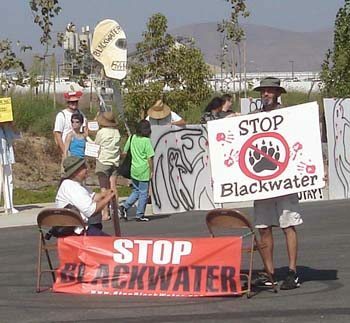 Mainstream media in San Diego were apparently boycotting any public protest about Blackwater in Otay Mesa. I didn’t see any U-T reporter and nary an American TV station. A variety of peace and activist groups sponsored the gathering, including the Peace Resource Center, Activist San Diego, Citizen’s Oversight Committee, San Diego Coalition for Peace and Justice, Veterans for Peace, and the local branch of the American Friend’s Service Committee. Dozens of their members turned out for the event, as well as other concerned San Diegans, willing to leave the pleasures and benefits of a beautiful day in paradise. I counted between 92 and 97 people present, with a few stragglers still arriving. It was just us, the protesters, our green-capped National Lawyers Guild monitors, and a few San Diego police cars. And one private security patrol car with a K-9 unit. (Ready to drive back crazed protesters trying to claw their way into Blackwater’s building, no doubt.) The spirit of people was up, the organizers were friendly and appreciative, and folks dutifully held their signs, banners and placards for all to see. Yet there was no one else there except the demonstrators. Not a single elected official was present. Bob Filner did speak via phone from Washington. But no one else. No Mary Salas, whose 79th Assembly District we were standing in; no Ben Hueso whose City Council district the protest and facility are in – although I was told his office has been “supportive,” no Donna Frye – darling of San Diego’s liberal and environmental electorate, no Laurie Saldana, no Denise Ducheny – big-time South Bay politician and former student radical, and no local community groups from San Ysidro or Otay Mesa were there either. I was told by Ray Lutz that it would have been inappropriate for Michael Aguirre to have been there, as he is carrying the appeal to the judgde’s ruliing that allowed Blackwater to open. That made some sense. Recently kicked out of the rural San Diego County town of Potrero due to community protests, Blackwater has opened its Otay Mesa training facility only after some legal maneuvering earlier this year. Having applied to open a learning institute under a shell company name, Blackwater was temporarily blocked by City Attorney Michael Aguirre’s efforts to force the company to comply with city laws and rules. But after hiring a big-name law firm in town, Blackwater maneuvered around Aguirre by going to Federal Court. There, a federal justice, appointed by President George Bush’s father, granted a restraining order against the City and effectively trumped local municipal and state law, forcing the City to allow Blackwater to operate its training program at the current location. With the federal judge’s help, Blackwater was able to avoid any public hearings, environmental reviews and other public scrutiny. Blackwater claims it has a multi-million dollar contract with the U.S. Navy to train military personnel how to fight. 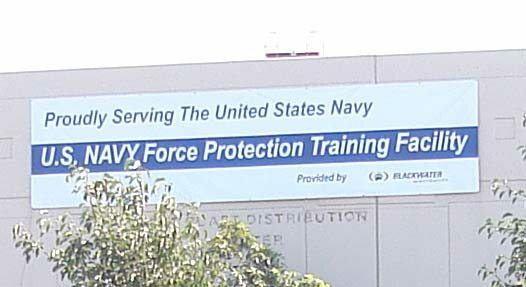 A large banner tied to its building, proclaimed: “Proudly Serving the United States Navy”. Not too long after 3 pm, Carol Jahnkow, director of the Peace Resource Center, opened up the rally. She spoke, Ray Lutz, a chief organizer of the event and candidate himself for the 77th Assembly District spoke, as did others, such as Pedro Rios of the American Friends and David Wiley for the vets (-apologies to those I did not mention). David Wiley from Veterans for Peace pointed out Blackwater is actually a huge conglomerate; it trains law enforcement, military and mercenaries, but it also manufactures all kinds of weapons, including aircraft. Blackwater has managed to garner over $1 billion in federal contracts -most no-bid – since 2001. Carol Jahnkow explained that San Diego was not alone in trying to kick Blackwater out its community. Folks in Winston-Salem, North Carolina, in Chicago, and in Coeur D’Alene in Idaho are having similar battles. An organizer for the Idaho efforts actually called in and spoke to the warm crowd out at Otay. Even though the numbers at the rally weren’t huge, everyone, including the speakers, was upbeat. “We beat Blackwater in Potrero, and we can do it again!” was a common refrain. Despite the lack of media coverage and absence of politicians, the hundred people who came to the protest were there for themselves – giving each other support on this issue – and they were also there for history. For history, at some point, will indeed remember who among us in these troubled days spoke out against groups like Blackwater. How anyone can protest against Blackwater is beyond me, I am proud to say that my husband was in it and I’m proud those brave men go out and do those missions. If i could I would stand right beside them with a gun in my hand fighting along side them. They risk their lives and some unfortunate have lost their lives doing their jobs, and those Iraqi people have killed so many of our men that we need people like Blackwater to take them out. Just take a look at what the Iraqi people did to our men in 2004 on the bridge. The Navy Seals who took out those Hajis are now having charges pressed against them, which is rediculous those guys deserved what those Navy Seals did to them, and I will defend them till the day I die. The rest of the world needs to stop focusing on the rest of the world and realise there is just as much criminal activity IN OUR country and leave the military and Blackwater alone to do their job.